I’m really on a roll this year- February has barely dawned, and I’ve knocked out the first item in my #menswearmake9 (see that post here! ), I’ve got my first pair of jeans in progress (see my sewing goals post here), and now I’ve completed my first #makenine item for myself: McCalls 7441! 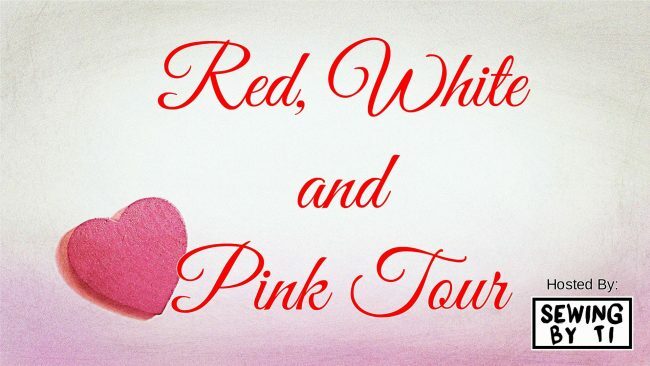 The timing was also perfect to jump in on the Red, White, and Pink Blog Tour, so here I am! Of course, I’ve also gotten the flu, we are about 40 lessons behind in homeschool math, and my sewing room could be classified as a federal disaster area most days, so don’t be too impressed. I haven’t sewn a “Big Four” Pattern in years- I really stocked up on them when I first started sewing, loading anything into my cart that got a stamp of approval on Pattern Review (which I LOVE, btw), but quickly became disenchanted with the disjointed instructions and excessive ease. Now that I’ve got my sea legs under me, in terms of sewing, I figured I could go back and make up for a few of these deficits- because they do have some cute designs out there that I can’t find in the indie world. And I’m not gonna lie, you can’t beat a pattern for a buck. McCalls 7441 caught my eye due to the gorgeous draped back, and the sporty/elegant feel (how often do you get that combo?). I was curious about how it was drafted, and it was the perfect excuse to snap up some of the heavy rayon spandex I had been eyeing at Simply by Ti Fabrics. 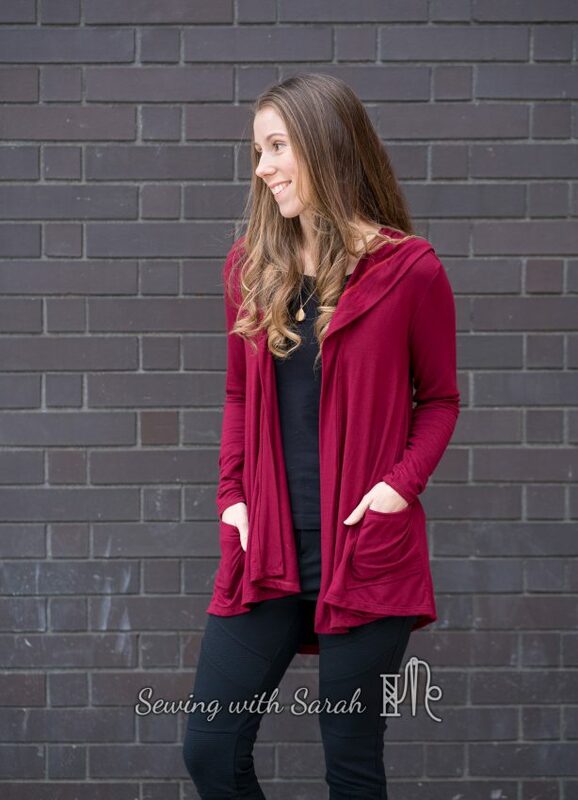 Typically rayon spandex is pretty thin, but this heavier blend makes it easier to work with, and more durable, while still retaining the luscious drape and feel of the usual stuff. I snatched up three yards (this pattern is a total fabric hog), and was itching to get started after it arrived on my doorstep. Once I had cut into the pattern tissue (for $1 a pop, it just isn’t economical to trace! ), I found my first hurdle- the pattern looked like a geometry textbook, with a plethora of dots, lines, and triangles everywhere. Which ones were important and which could be ignored? 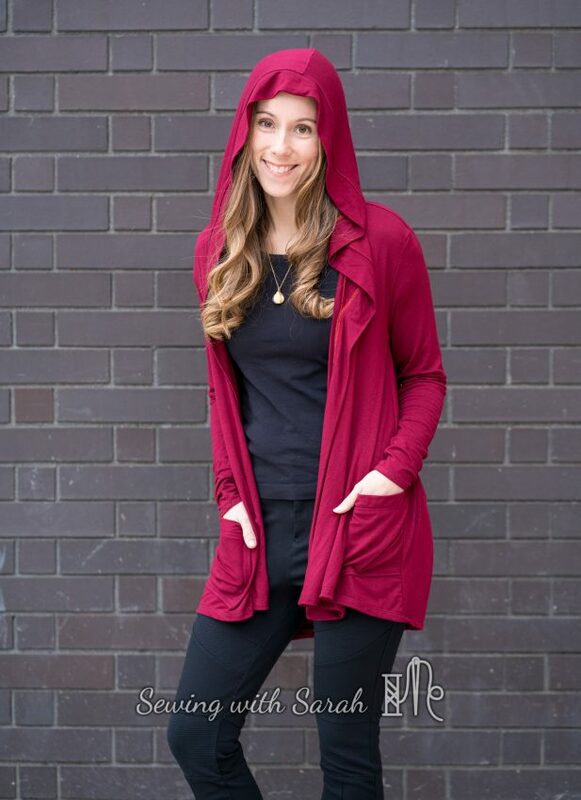 I perused the instructions, and decided to ignore most of them, but marked the location of the pockets and the place where the hood meets the front of the cardigan. Once that was done I was ready to sew! I did a quick speed-read of the instructions, and promptly tossed them. Who sets in sleeves in a knit? 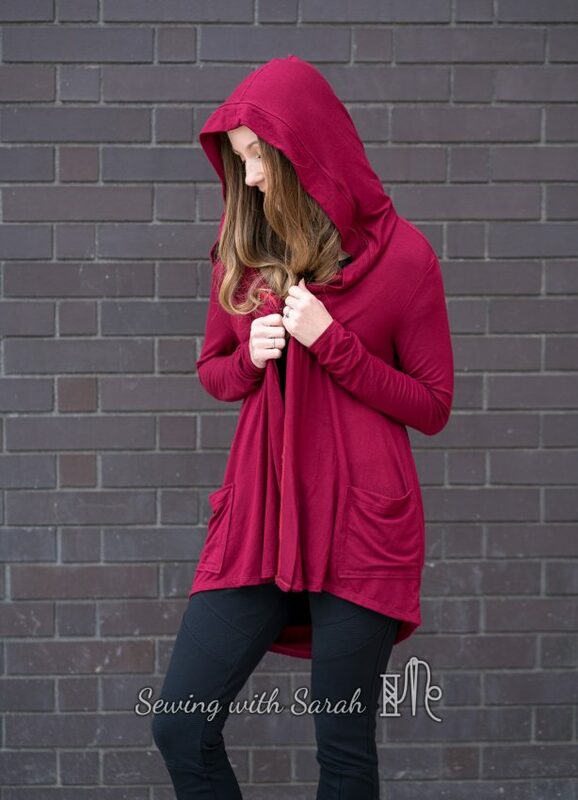 Why stay-stitch before attaching the hood? Why trim and grade seam allowances when you can serge? They also don’t tell you to do things you probably should do, like stabilize the shoulder seams with elastic or knit stay tape, an especially important step with this heavy knit. 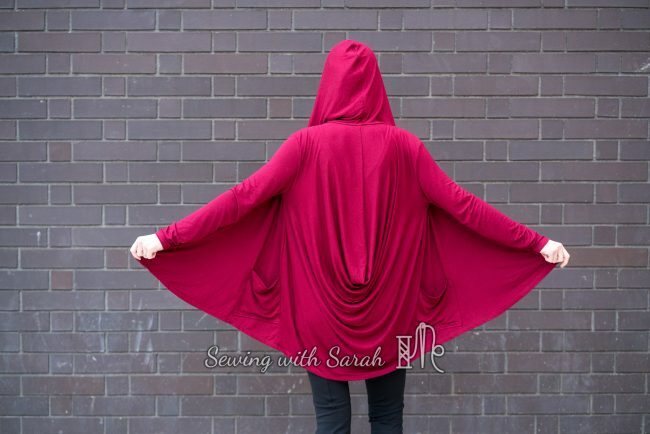 I also fudged the part where the hood meets the bodice- I couldn’t tell exactly what was supposed to happen, and didn’t really like the way it was coming together with a simple hem on both, so I decided to add a long band that went around the entire cardigan front and hood, serging it on and then topstitching it to keep the seam allowance down. I think this makes for a much cleaner finish, and adds a little extra coverage in front as well. My last modification was removing about 4″ in width from the sleeves- in a strechy knit like this, I like to have them fitted, and the way they were drafted was more like a coat than a light cardigan, IMHO. The pockets are really nice though- plenty big enough for my phone and hands! I’m in love with the color- and the way the back drapes. I don’t know if I’ll make this pattern again, as it’s such a unique look, but again, I don’t feel bad since it was only a #1 investment! I’d love to stay connected with you! You can “like” my page on Facebook, and follow me on Instagram to see what I’m up to! This is SO gorgeous. That drape is amazing. I haven’t used a paper pattern in a LONG time. Their instructions are pretty much useless! I hope you are feeling better! 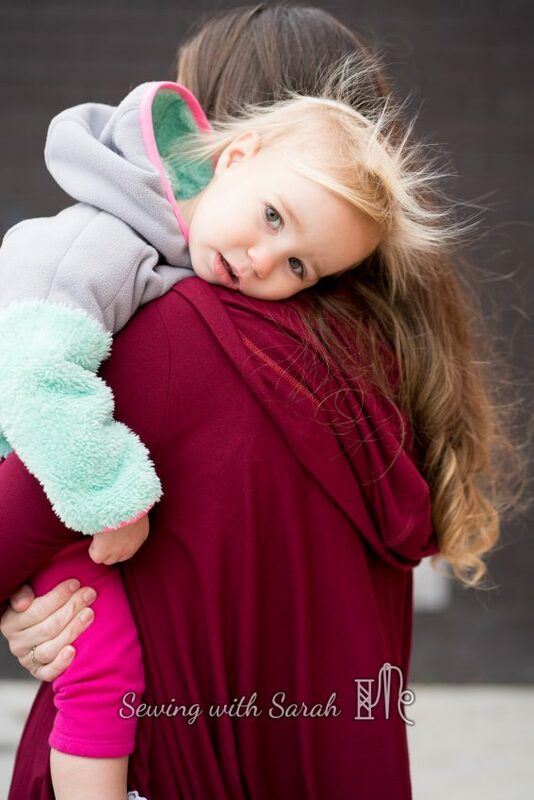 The flu is a nasty knockout, especially for such a busy mom. I thought it would take much more than it did! The drape part isn’t nearly as big as I imagined before I saw the pieces. Have fun with it! Gorgeous! 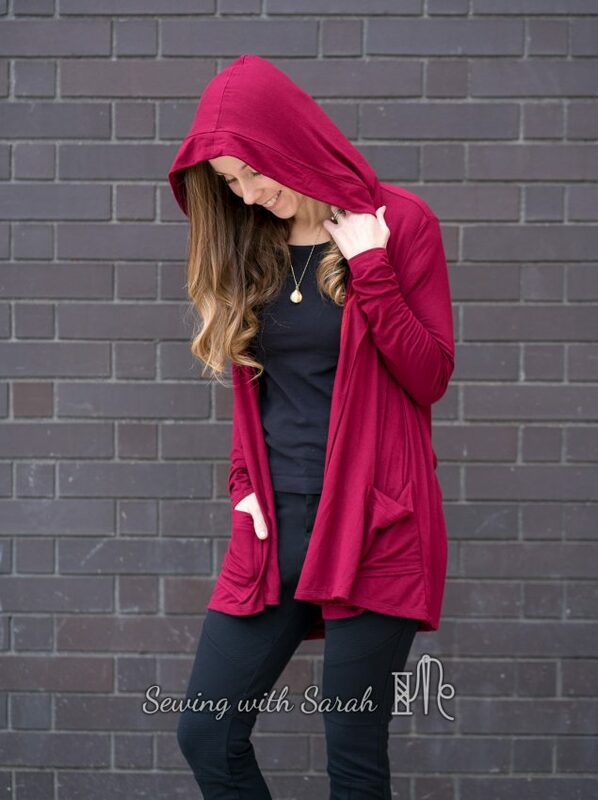 This looks fabulous on you! Thank you Tenille! Sometimes I can tame the hair…other days not so much! You did such a beautiful job pairing the fabric with the pattern!! I love seeing the drape in the back, this is gorgeous!! Thank you! It’s a favorite for sure! I can’t believe I’m just now seeing this! I was looking out for it after your teaser photos, but still missed it somehow. Glad I came back to read. You are always so fun to read and your pics are so great! Loving this cardi! That rayon is incredible. You make me want to order some, too! I’ve been curious about sewing things from the big 4 for a little while now, but have been too scared to make the jump. Funny that it would be like going backwards, since I started with PDF sewing patterns. You’re absolutely right about the unique looks you can find, and you really can’t beat $1! I’ll have to start looking and see if I can find something worth cutting the tissue paper for 🙂 Also: completely unrelated…but I love that you guys are homeschoolers! I was homeschooled growing up! Thank you so much for sharing your make! Can’t wait to see what’s next!